Originally a family home for our vendors where laughter was had and memories were made. The large, sun drenched backyard played host to a myriad of outdoor games and was perfectly positioned for entertaining next to the BBQ. With the French doors welcoming guests from the front balcony, indoor entertaining was just as perfect. The open plan lounge and dining area that flows through to the galley style kitchen with breakfast bar ensured there was room for everyone! 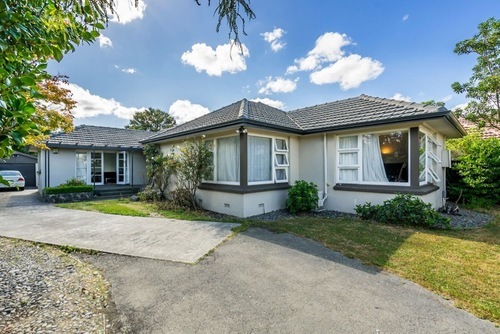 With a move to the North Island, this family home has now become an investment for our vendors. Positioned in the increasingly popular suburb of Mairehau and packed full of convenience and comfort, popularity has always been high. Currently tenanted for $480p/w until May, what is the future for 10 Manuka Street? Will you secure this property for your future family home whilst receiving income for the duration of the tenancy, or will you add this popular positioned investment to your portfolio? With interest expected to be high, don’t delay in viewing this exceptional opportunity.